Marching Bass Drum Lyre easily attaches to right, top side of bass drum. Molded from black ABS plastic and reinforced at stress areas this lyre withstands the rigors of marching band. 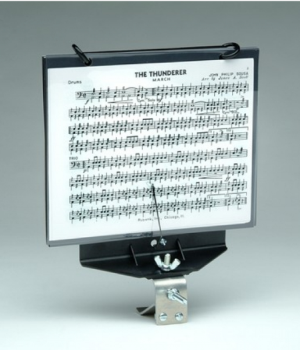 Spring loaded Wind Clip holds windows for easy flipping This is the only marching bass drum lyre available… from DEG, of course. Supplied with five clear plastic windows and two plastic rings. Individually packaged.